Nancy Adams explains how genetic disorders are passed down through family members. In the early ’70s, Nancy James Adams ’60, ’77 MS routinely made the trek between Burlington and Greensboro. The Woman’s College (now UNCG) alumna often attended seminars and other events at her alma mater. As she rolled down the interstate in her blue Buick one day in 1973, Adams heard something on the radio that caught her attention. “I don’t remember what station I was listening to, but they used two terms I’d never heard used together – ‘genetics’ and ‘counseling,’” she recalls. She was immediately hooked on the idea that led to a groundbreaking career as a genetic counselor. At that time, there were only two genetic counseling programs in the nation, and neither of them were even remotely close by. So, Adams took matters into her own hands. During one of her visits to UNCG, she talked to Dr. Bruce Eberhart, dean of UNCG’s biology program, and explained to him exactly what she wanted to do. Even though UNCG didn’t have a genetic counseling program at the time, Eberhart was determined to make a way for Adams to achieve her goals. So, he allowed her to build a curriculum from the genetics and psychology courses the university already offered. “No one else had ever done this. They allowed me to develop that curriculum. I don’t know if another school would have done that for me,” she said. All of the academic classes Adams needed were available at UNCG. The only missing piece was the clinical part of her studies. Dr. Francis Collins, a famous pediatric biochemical geneticist, agreed to oversee Adams’ clinical studies at the UNC-Chapel Hill hospital. After four years of commuting to UNCG for classes and Chapel Hill for clinicals, Adams received her UNCG master’s degree in biology with an emphasis in human/medical genetics. She went on to become the first certified genetic counselor in North Carolina. “Genetics is the ultimate preventative medicine,” Adams said. 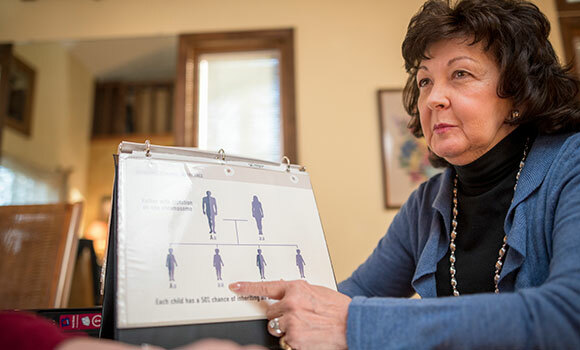 Genetic counselors analyze bloodwork and a detailed family history to determine an individual’s risk of developing certain genetic conditions. Then, they also help the patient determine the best preventative and screening measures if they’re at an elevated risk. “Genetic counselors are the liaison between the doctor and the lab’s gobbly-goop and the patient. We are patient advocates,” she said. Adams worked in the pediatrics unit at the UNC-CH hospital, and then went on to work in maternal-fetal medicine, where she developed the second maternal serum screening program in the nation. Later, she became the first genetic counselor to work with a commercial lab, and she developed LabCorp’s genetic services department. After she retired from LabCorp as an associate vice president, Adams agreed to take on a few cases in Cone Hospital’s oncology department. Her patient load quickly went from part time to full time, and she frequently had UNCG genetic counseling students shadow her. Although she officially retired (again) two years ago, she still takes on a few volunteer cases from time to time. Adams was also an integral member of the planning committee for UNCG’s genetic counseling master’s program, which opened its doors in 2000. In 2013, she was awarded UNCG’s School of Health and Human Sciences’ Alumni Lifetime Legacy Award. To learn more about Nancy Adams and her career as a pioneer in the field of genetic counseling, read the full story in the Spring 2016 UNCG Magazine.